L'Oréal Paris Haircare is no stranger to many. Because of it's affordable price tag, I recall myself using their products since a school kid. Despite being a drugstore brand, their constant innovation continues to benefit many of us, making sure we're enjoying the very best. That is why it's no surpre that L'Oréal Paris has been titled the No. 1 Trusted Haircare brand in Singapore! 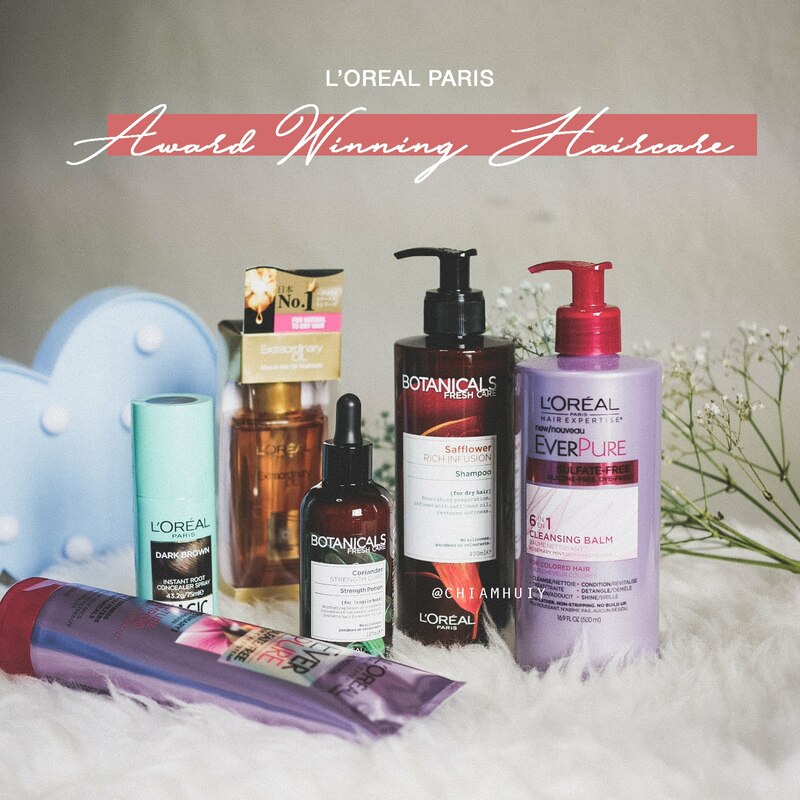 From left to right, these are some of the items crowned to be the best of L'Oréal by people from different walks of life. Elseve Extraordinary Oil is one of my personal favourites. The nourishing oil keeps my hair oh so moisturised, plus it smells amazing! The texture of this hair oil is slightly thick but it feels lightweight when applied onto dry hair ends. In fact it's perfect for the purpose of nourishing dry hair. 6-in-1 Cleansing Balm has became my go-to shampoo because of the convenience. I know how shampoo can strip off moisture from our hair, and this certainly did much better. You'll feel your hair instantly smooth and tangle-free after one wash. Not kidding, speaking from personal experience. Finally, Magic Retouch Instant Root Concealer Spray sounds like a life savior for bald spots! Constant tying of hair can cause damage to your hair follicles. Otherwise, age can be a contributing factor to residing hairline or bald spots. When this happens, Magic Retouch Instant Root Concealer Spray will be a good friend! I'm also holding a giveaway so that you can win this entire set!